Representatives from Maine’s wood products industry unveiled their plan on Tuesday to grow the state’s forest economy by more than $3 billion over the next seven years. Representatives from Maine’s wood products industry unveiled their plan on Tuesday to grow the state’s forest economy by more than $3 billion over the next seven years. The Forest Opportunity Roadmap is an ambitious plan that relies on innovation and technology. 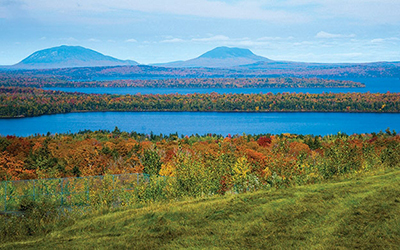 Today, Maine’s forest economy is pegged at about $8.5 billion a year. The goal of the group is to increase that to $12 billion by 2025. The plan is to maximize existing resources and add new technologies and products. “Our vision is that Maine is a global leader in the forest products economy with a thriving, innovative and diverse industry that provides good jobs in Maine’s rural communities,” says Steve Schley, the retired president of Pingree Associates, one of the state’s largest landowners. Schley says innovation is key to maximizing the value of forest products. For example, he says a wood byproduct that is now is used as fuel to fire a boiler could have a higher market value in another form. Charlotte Mace, executive director of Biobased Maine, says research at the University of Maine and in the private sector is helping to develop the products of the future. “We also have technologies that are in the pilot scale, that are at the demonstration scale and are at the commercial scale. So as Maine moves forward, in collaboration with the Maine Technology Institute, we are interested in all of the above,” she says. Mace says the array of projects is significant, and that and many of the newly emerging products can be added to the lines that existing wood products plants are already producing. Jim Robbins of Robbins Lumber in Searsmont says his company is completing construction of a new plant designed to take advantage of new technologies that are either already in the pipeline or that may be developed in the future. “It’s been a $36 million project and the direct and indirect economic impact alone of just building that plant we estimate at $21 million which is supporting 170 full time equivalent jobs,” he says. Robbins says he expects as new products are developed that can be spun off from that plant, the economic impact will increase. Yellow Light Breen of the Maine Development Foundation says the goal is to leverage the results of research and development of new wood-based products to attract private investment to the state. But he acknowledges that state government will have to do its part to support the infrastructure needed by the industry. “It will take a lot of public private partnerships and we believe some investments in transportation and R&D and so forth, but we know that Maine cannot afford $100 million incentive packages for businesses to move here,” he says. Several speakers also stressed the need for access to broadband connections in the rural areas of the state, where many of the wood products plants are located. They also acknowledged the need to garner political support in the state for the effort, and have been meeting with legislative candidates across the state to discuss the plan. Schley says he has also spoken with the four candidates vying for governor. “I think I can honestly say that having had those conversations with each of the candidates and their staffs, they get it. They understand there is real opportunity here,” he says. The roadmap has been two years in the making. The goals it lays out are not only to grow the woods industries, but to make sure the forests are managed sustainably to preserve them for future generations.